UPDATE: Source code posted here. Fine and simple. A few lines of code and you are calling your service getting it back value data. This is a synchronous call. Of course there are ways to make async calls with ASMX services, but my point is that most typical implementations of ASMX services aren't like that from what I've seen in casual use. This is where Silverlight may differ for these developers. 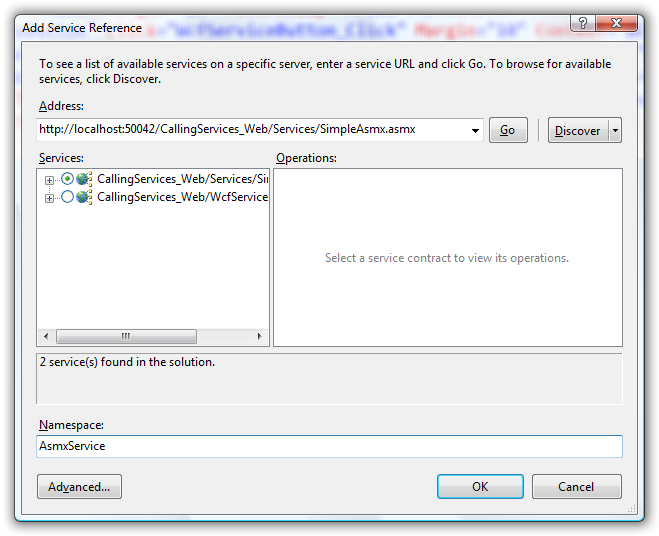 In Silverlight 2, all service calls are asynchronous. Let's take a look at how this is accomplished. That represents the Silverlight application. 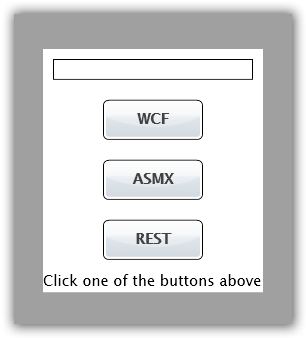 In the web project hosting the Silverlight app, I have 2 services: "SimpleAsmx" and "WcfService" -- aptly named so that they clearly represent the implementing technology. They are both simple services that expose a method that takes a single string param and basically outputs it back out. Again, the service portion is not what I'm concentrating on here -- I'm looking at the calling of the service. UPDATE 19-MAR: The code below will absolutely work (specifying the binding and endpoint information). However, you can also choose not to specify the binding/endpoint and it should still work. For the WCF service code below, if you don't change the wsHttpBinding to basicHttpBinding BEFORE you make the service reference in your Silverlight application, then you will have to update your service reference in your Silverlight app (simply right-click on the service and choose 'update service reference'). Doing this will generate the correct proxy code for basicHttpBinding and enable you to just call the code using proxy.YourService() as a constructor rather than using a binding and endpoint. Basically when the event completes, the arguments provide us a Result object that represents the return type, in this case a String. I can then put that string in my TextBlock as output. 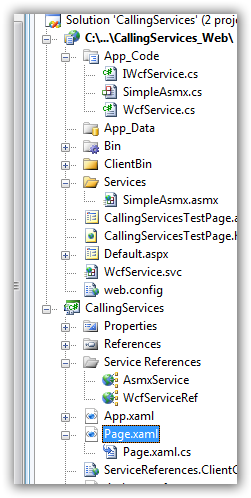 And there you have it...we've called a simple ASMX web service. And then you are done and the code should work. Now let's talk about REST. What is REST? Representational State Transformation...read about it here. REST basically takes advantage of existing HTTP verbs (GET, PUT, POST, DELETE) and enables access to actions based on those. Because of this there is no real "contract" as you may be expecting, or WSDL definitions. You execute a verb and you'll get a response, usually in XML. Because there is not contract essentially, the 'Add Service Reference' won't work well for you. Instead in Silverlight you'll want to use WebClient or HttpWebRequest. What's the difference? Here's the timheuer version. WebClient is a simpler implementation doing GET requests really easily and get a response stream. HttpWebRequest is great for when you need a bit more granular control over the request, need to send headers or other customizations. For my sample here, I'm using WebClient because that is all I need. First a note on remote web services, aka cross-domain services. In Silverlight 1.0 you couldn't directly access cross-domain services. In Silverlight 2, we are enabling support for doing that. The approach we've taken so far is one where we have put the control of the access to the service to the owner of the service. What that means is that you can't call *any* service on the web, but rather ones that have enabled permission to sites (or everyone) to call their services via rich internet applications. Flash has enabled the same procedure for a while. They use a policy access file called crossdomain.xml. You can read more about this format at crossdomainxml.org. Silverlight 2 currently supports the exact same policy file. In addition, Silverlight has a policy file format, but in the end, both are supported, which is cool. So if you have a web service on a domain separate from your Silverlight application, you'll have to create the policy file at the endpoint root of your web service to enable rich internet platforms to support it. The "flickrApi" variable represents the REST api call to search photos for Flickr. So that's it, web services (hopefully) made simple. I hope this helps. What did I miss?